After spending the last two days cooking up our own Thai dishes and training elephants, Simon and I looked forward to enjoying a day of relaxation with nothing on the agenda except to roam around and get lost. 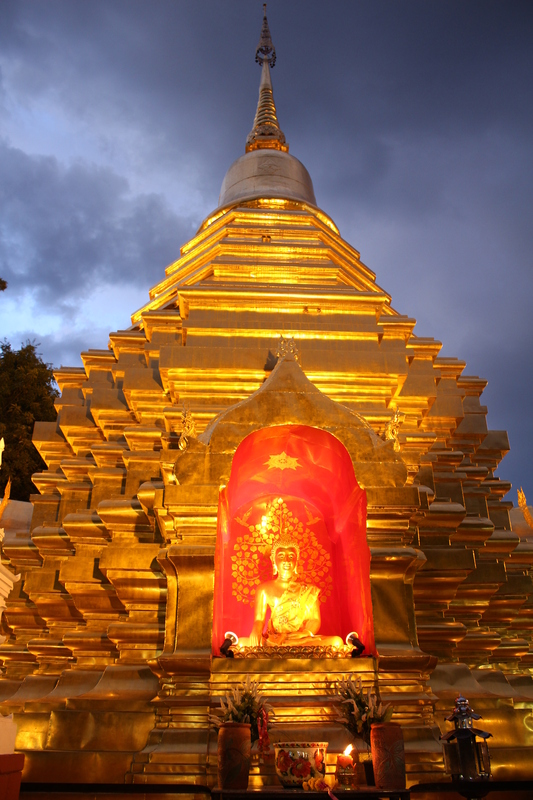 Chiang Mai, the northern capital city of Thailand, is everything that Bangkok is not. Whereas the southern capital boasts opulent mega malls, endless sightseeing, a thriving nightlife, and all the other luxuries of a chaotic concrete jungle, Chiang Mai offers a cooler lush oasis of an actual jungle and a slower pace of life. In and around the city, there are over 300 ancient temples, many of them dating back to when Chiang Mai was founded over 700 years ago. Despite being the fifth largest city in the country, from within the walls of its historical old city told us a different story. Surrounded by a moat, the one square mile of Chiang Mai’s old city is home to narrow, sidewalkless streets, with the promise of cool street art and temples at every corner. It is in this calmer part of the city that allowed us to peek through the window of ordinary locals milling about their daily activities. An elderly grandmother fanning herself in the shade. Young kids with dirt-smudged knees playing tag. A small shop owner sweeping his stoop. Monks in orange robes hurrying to prayer. This is what real Thailand is like. 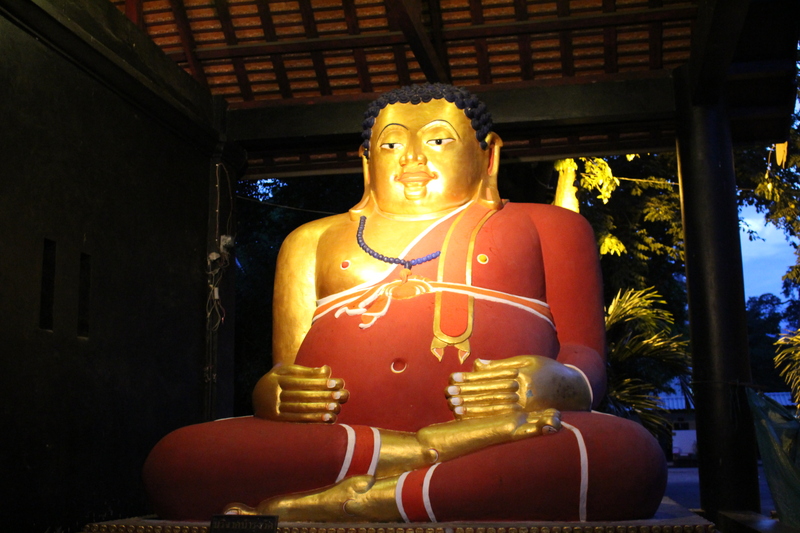 Instead of elbowing other tourists for photos or long queues to get into attractions, we were afforded a relatively quiet up close and personal visit of the many temples inside the old city walls. Though they are much smaller in scale and could never compare to the extravagance of the Grand Palace in Bangkok, they possess a tranquil understated beauty that does not boast or brag. A temple should be a place of serene refuge, and this was none the more true as we aimlessly ambled through the peaceful temple grounds. With just a handful visitors at any given time, it felt like Simon and I had the temples all to ourselves. 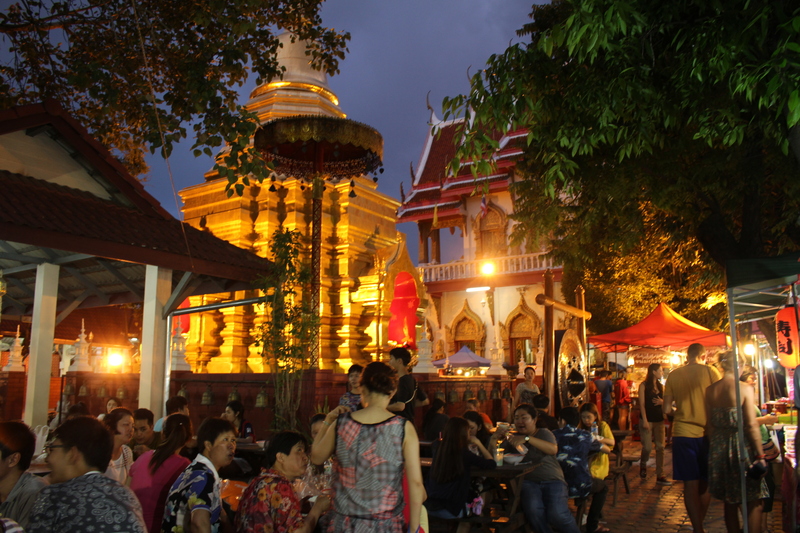 The quiet ambience hung heavy in the air, and no matter if it was a statue weathered with age or a temple with a fresh coat of paint, each one provided an intimate encounter with a piece of Chiang Mai’s history and culture. As the sun began to sink closer to the horizon, and the blue sky faded into a pale shade of violet, the streets started to come alive with activity. It was time for the Sunday Market to begin. The sleepy streets we had wandered through all day now became flooded with tourists and locals taking to the asphalt. Food and craft vendors that had been setting up shop since the early afternoon braced themselves for the evening rush. Rows of empty massage chairs set up under event tents waited anxiously for their first customers of the evening. A hubbub of activity, this famous weekly bazaar provided the hustle and bustle that we had been missing all day. 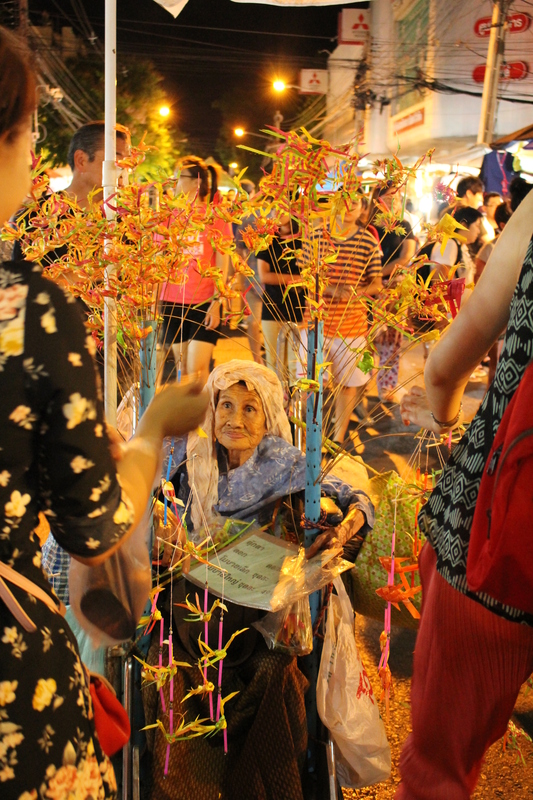 Local grub, handmade crafts, Thai massages, and street entertainers added to the festive atmosphere, amidst the backdrop of temples illuminated by lights as night fell. We dined on meat skewers, spicy sausages grilled to perfection, and of course, had our last bowl of khao soi noodle soup, a specialty in this northern region of Thailand. We wandered around some more, admiring the locally made crafts, absorbing as much as the sights as we possibly could. Despite the popularity of the Sunday Market drawing throngs of people out of their homes, it was never too crowded. In the sea of locals, I had forgotten that I was just a transient tourist. After being on the road for so long, it was nice to slow things down, and Chiang Mai’s laid back energy provided the sanctuary that we needed.